You don’t necessarily have to use these particular polishes if you have others in mind, but these are all under £2.99 and work fabulously. The first colour you’ll need is a bright or dark pink, I’ve chosen Barry M’s Shocking Pink (available here) as it’s a great no-fuss fuchsia colour that is opaque in one coat and is only £2.99. This will serve as your base for the next polish. The next polish you’ll need is an iridescent colour, I’ve chosen 2True’s Crystal Polish in Shade 6, which goes from a pink to an orangey-gold colour. 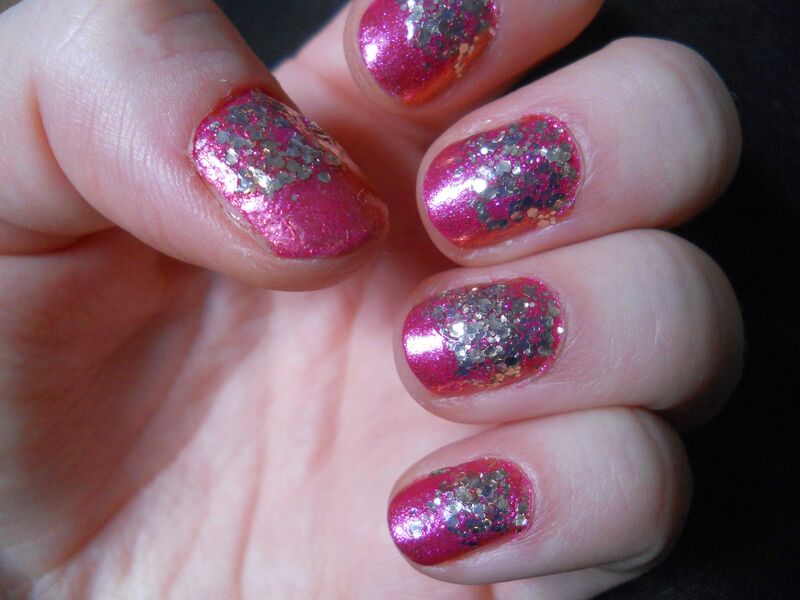 I think having a shimmery polish on before the glitter polish really gives the nails a more 3D effect. 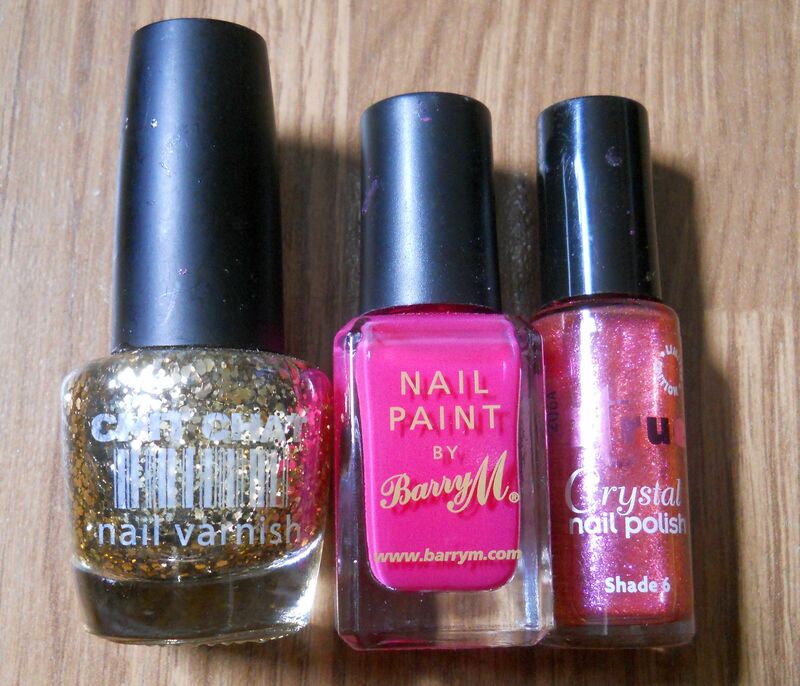 The 2true polishes are all £1.99 and available at Superdrug. Finally starting from the bottom of your nail, you want to apply several coats of gold glitter polish, applying the polish more lightly as you go up the nail to create a gradient effect. Leave the top 1/4 of your nail unpainted to really maximise the look. 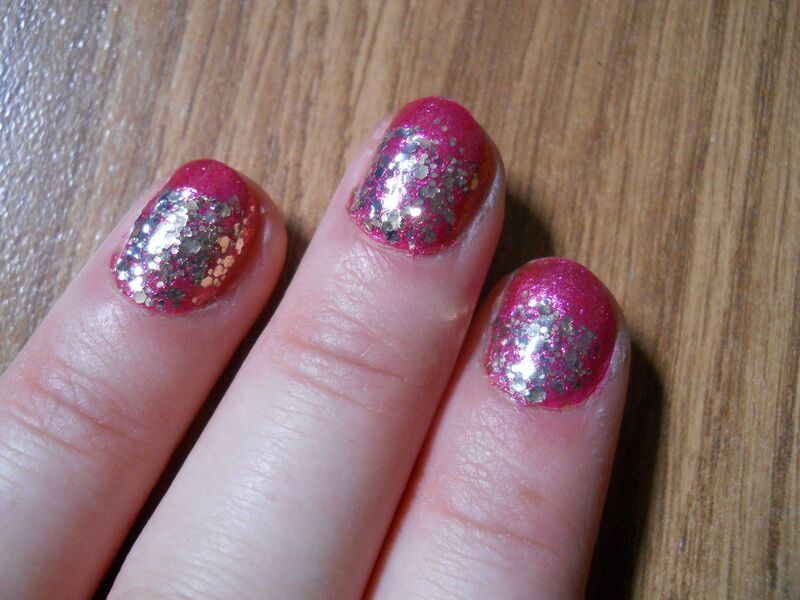 For the gold glitter polish I’ve used Chit Chat’s Gold Glitter which is available for £1 at Poundland, obviously! I love this gradient sparkle look and it’s perfect for parties or special events that you might have coming up this autumn/winter. It doesn’t take long to do and the effort required is minimal. All of these polishes are favourites of mine, particularly due to their fast-dry qualities, so you definitely won’t be hanging around waiting for these to dry before a night out. Disclaimer: All products were paid for by me. No links are affiliate links, this not a sponsored post.